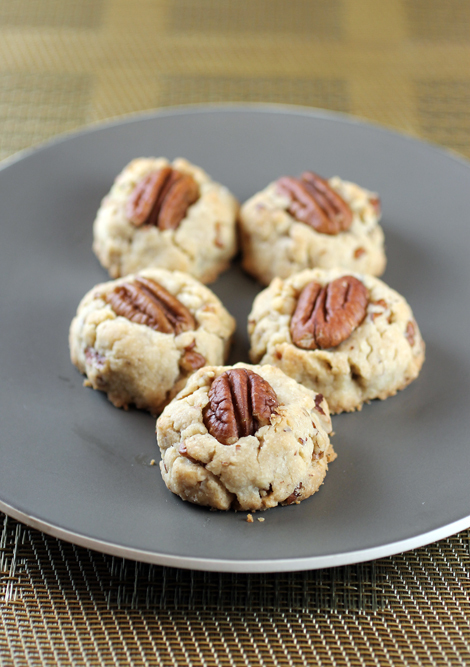 Buttery shortbread with pecans and plenty of browned butter. Your honor, I can’t say I’ve sampled every pecan shortbread cookie in the world. But this one sure does pose a strong case for being the best, as it so claims. Let me call my first witness — the cookie, itself. Here you have the melt-in-your-mouth, crumbly evidence. It’s chock-full of pecans, then crowned gloriously with one perfect pecan half. What makes this cookie even more decadent is that you coat the chopped pecans that get stirred into the dough in two stick of butter that you slowly and ever so carefully melt on the stovetop until the butter turns deeply golden and fragrantly toasty. Then, add all the other ingredients straight into that pot to finish making the dough — all without a mixer. How easy is that, your honor?